Turdus roseus Linnaeus, 1758, Lapland and Switzerland. 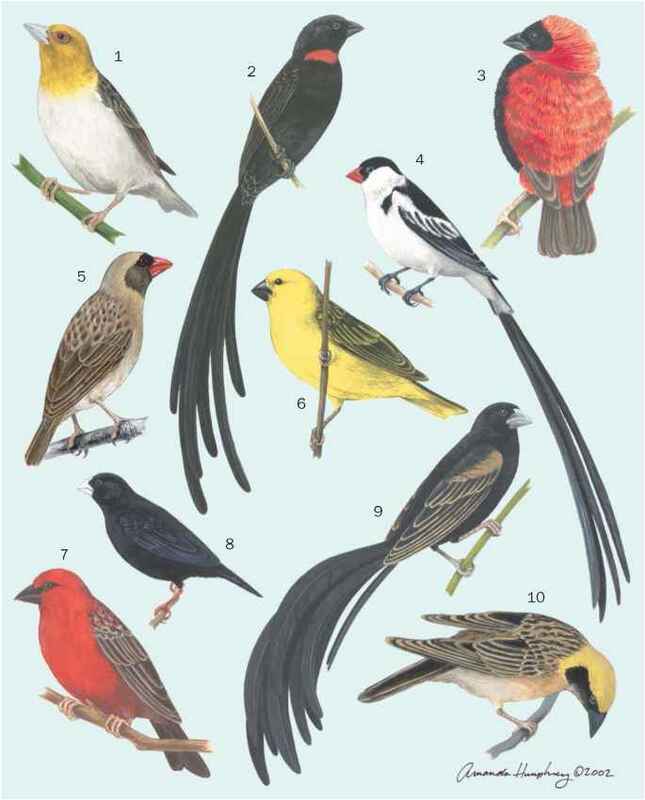 English: Rose-colored starling, rosy pastor; French: Étourneau roselin; German: Rosenstar; Spanish: Estornino Rosado. 7.5-9.1 in (19-23 cm); weight 2.1-3.1 oz (60-88 g). Black head to upper back, chin to base of throat, wing feathers, tail, and vent. Pale rosy back, breast, and abdomen. Bill ivory-yellow. 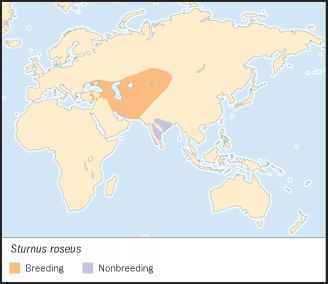 South-central Eurasia; generally found where locust swarms are regular; winters primarily in India, but wanders widely. Found in semi-desert areas with thorn bushes; other barren areas, including industrial sites, agricultural areas, lawns, and pastures. Migrant; very gregarious. This is often a roadside bird, coming to puddles to bathe and drink as well as to bare areas to feed. Diet includes primarily insects, especially grasshoppers, crickets, and locusts, but also grapes, mulberries, and other fruit. It often feeds in association with cattle. Nests colonially in holes among rocks, in walls, or similar sites. In some studies, young were fed almost exclusively crickets and grasshoppers.